From the album jacket of "IRAN --Hassan Kassai: Le Ney" (Playasound productions,France). 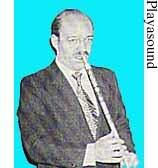 Hassan Kassai plays with "lips and teeth" having regard to the Irano-Turkmen technique. According to the breathing power and the register wanted: loud of low, bass, medium of treble, he blows in his ney aslant, at lips or at teeth. He takes the highest from his reed: melodies accurately performed, simply or complexly "conceived", finest nuances, even simple or mixed and embraced rhythms. Did you understand that? That's okay. Just listen and enjoy.